Ritual Soba Making at Ibaraki Gokoku Shrine is one of the major Soba Matsuri in Mito. It is hold in the beginning of December. 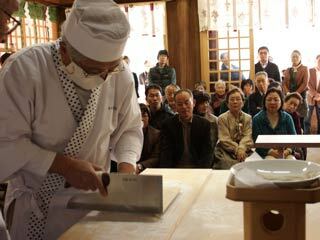 There is Shinto Ritual before making soba and demonstration of Soba Making at the shrine. After the ritual, people eat soba. Need to sigh up before join this event. Fee: 2000 yen. Only for 100 people. Eat as much soba as you can.